In one step toward victory in the fight against white supremacy in North Carolina, the Durham County district attorney has dropped all felony and misdemeanor charges against three people present when Durham freedom fighters toppled a Confederate statue on Aug. 14. 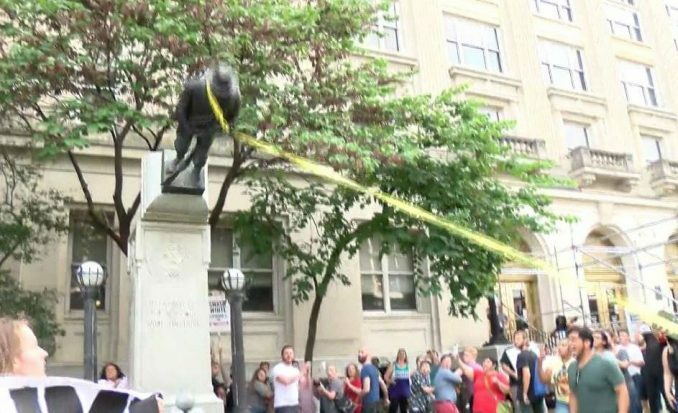 Six of the people charged in connection with the statue takedown will appear in court in Durham on Nov. 14. They face very serious penalties including “misdemeanor damage to real property” and “felony inciting a riot to cause property damage in excess of $1,500,” which carries a potential sentence of 2 to 3 ½ years in prison. UE Local 150, North Carolina Public Service Workers Union, has issued a rousing “Labor Call to Action” in support of the freedom fighters. The union local asks for people to call Durham County District Attorney Roger Echols at 919-808-3010 and N.C. State Senate President Phil Berger at 919-733-5708 on Nov. 14, the activists’ day in court.